In the age of the mega corporation, it's refreshing to see that a family-owned cruise company can continue to survive and thrive. Fred. 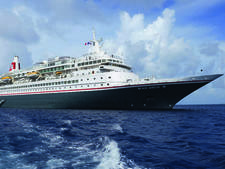 Olsen Cruise Lines -- still owned and operated by the family that originally founded it back in the 19th century -- is a prime example of the power and pull of tradition. Its story began in 1848, when Frederik Christian Olsen, one of three seafaring brothers living in Hvitsten, a small town on Norway's OsloFjord, bought two schooners. His brothers Petter and Andreas who, like Frederik, worked as ships' captains, quickly followed suit, as Petter acquired the sailing brig Thilda in 1852, and Andreas became the family's third shipowner in 1860. Between them they founded a powerful shipping dynasty, building up a large fleet of trading ships that carried cargo and line passengers around the Mediterranean, the North Sea and the Americas. Today the company operates ferry services in the Canary Islands and owns a controlling interest in the Harland and Wolff shipyard in Belfast, which built the Titanic. In 1966, the company started to build a presence in the cruise business after acquiring the Black Watch and the Black Prince, two 10,000-ton combination cargo, car and passenger ships. 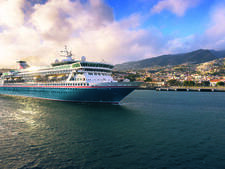 While Black Prince spent the summer months operating ferry services from the United Kingdom to Norway and Holland, in the winter months the ship carried holidaymakers on sunshine cruises from the U.K. to the Canary Islands, and the Fred. Olsen cruising brand was born. 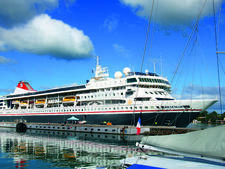 The company now operates four cruise ships year-round and is famed for creating a "British country house" atmosphere at sea, with the emphasis on cosy intimacy and very traditional cruising that eschews the glitzier facilities of more contemporary lines. Balmoral, originally launched in 1988, has a strong and loyal base of British middle-aged to mature passengers, who travel only with Fred. Olsen. Expect a cosy, traditionally British cruising experience on a Fred. Olsen ship. The onboard currency is Pounds Sterling; interior decor is comfortable and attractive but not flashy, and evening entertainment is muted and fairly old fashioned (singing, dancing and cabaret). Fred. Olsen Cruise Line's ships are relatively small, and they look like traditional cruise ships, rather than floating hotels. Drinks remain affordable; passengers still change for dinner (into black tie on formal nights) and the highlight of each evening is a five-course meal, which will be of decent quality and pleasantly served by friendly Filipino staff. The atmosphere is friendly, the service is efficient but unobtrusive, and the decor is familiar and relaxing, with ample seating in the public rooms. On sea days, passengers bask on deck and watch the world go by over a good book from the ship's library, or participate in a rather good Vistas special interest program, which offers classes in a range of subjects from gardening to wine appreciation, history to wildlife watching and painting classes. In a nutshell, passengers in search of around the clock action need not apply. These ships will suit lovers of old-style cruising, who enjoy peace, quiet and the gentle art of conversation. Fred. Olsen passengers are predominantly British and their average age is 67, though on some ships -- notably Braemar -- that drops in the summer months when children's activity programs are offered to please doting grandparents who want to spend some quality time with their loved ones. During school holiday time, it's not unusual to find several generations of families all cruising together; groups of friends who first met on an Olsen cruise and make an annual date for a reunion are also a common sight. The line has recently begun marketing some ships and some trips to North American passengers; Balmoral and Braemar, especially, have been tweaked to appeal to both sensibilities though the line has not lost its inherent Britishness in its effort to appeal more widely. There are four ships in the Fred. Olsen fleet: Balmoral, Black Watch, Boudicca and Braemar. Balmoral entered service in 1988 and was operated by Norwegian Cruise Line before being bought by Fred. Olsen. A 99-foot extension was added to the mid section, and the extended ship was launched in 2008 (tonnage: 43,537, passengers: 1350). Black Watch entered service in 1972 and was operated by Royal Viking Line before being acquired by Fred. Olsen in 1996 and refitted in 2009 (tonnage: 28,613, passengers: 804). Boudicca entered service in 1973, was operated by Royal Viking Line, stretched in 1982 by adding a 91-foot mid-section, and acquired by Fred. Olsen in 2005. It was refitted in 2011 (tonnage: 28,388, passengers 880). 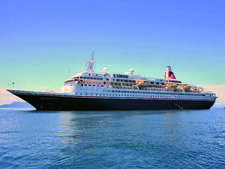 Braemar entered service in 1993 as Crown Dynasty, was acquired and refurbished by Fred. Olsen in 2001 (stretched by 102 feet) and refitted in 2008 (tonnage: 24,344, passengers: 929).